Beijing 100012, P. R. CHINA. Thirty-three years after its previous apparition, comet P/Temple-Tuttle has returned to its perihelion in 1998 and crossed the orbit of the Earth. This event was a perfect reason to initiate a cooperation between the Purple Mountain Observatories and Beijing Astronomical Observatories of the Chinese Academy of Sciences and the Dutch Meteor Society. In 1998 an expedition to the Delingha and Xinglong astronomical stations was organised to observe the expected outburst of the Leonids. During the night 16/17 November 1998 a steady stream of bright fireballs appeared which at first surprised observers around the world. After analysis it became apparent that these bright meteors are members of dust particles released by comet P/Temple-Tuttle in the year 1333. The next night the real outburst came although less pronounced as expected. In 1999 another outburst of the Leonid meteor stream was expected which would be best observed from European areas. Again members of the Dutch Meteor Society setup an expedition to monitor this outburst by means of visual, photographic and image intensifier techniques. Now, in contrast to the 1998, a real outburst occurred and at the locations in Spain about 3500 meteors an hour were counted many of which were captured photographically from several stations and on tape with the help of image intensifier systems. It is proposed to launch another expedition in 2001 to make again detailed observations of the structure of the comet's dust cloud via meteor observations. The observations will include countings of meteors per minute by well-trained visual observers, as well as photographic and video recordings of meteor trails from multiple sites, to determine atmospheric trajectories and heliocentric orbits of individual meteoroids. Special attention will be directed to meteors with extreme beginning heights as first observed in 1998. The expedition will be part of a programme for co-operation between the National Astronomical Observatories which is part of the Chinese Academy of Sciences and the Dutch Meteor Society. In 2001, alongside the expedition to China, Dutch scientists will provide guest lectures on meteor observation and data reduction techniques. Another expedition of the Dutch Meteor Society will be setup in the United States in which country another outburst will be visible caused by a second dust trail of the Leonid meteor stream. 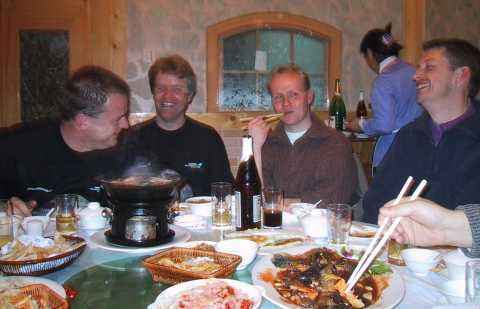 In 2002, Chinese and Dutch scientists will work together on a single location for some time to progress the joint publication of results from the 2001 expedition. The 2001 Leonid meteor storm provides a unique opportunity to study the ejection process of dust from a comet. Since the dust particles that encounter the Earth during the storm have not been perturbed since their recent ejection from the comet, they still bear the footprints of this ejection process. With relatively simple means observations can be made which complement much more expensive missions such as the past Giotto space mission to comet P/Halley. Better understanding of the dust ejection process from comets is directly relevant to modelling the total population of comets, their mass distribution and the classification of Solar system minor bodies into asteroids and comets. Meteor storms such as produced by the Leonid meteor shower are very rare. This century, phenomena of this magnitude were observed only with certainty in 1933 and 1946 (Draconid meteor shower) and 1966, 1998, 1999 and 2000 (Leonid meteor shower). In 2002 presumable a last outburst of the Leonid meteor stream will occur but then heavy moonlicht will interfere. Therefore the outburst in November 2001 will be the last chance to observe an outburst at its full power and this is why we are encouraged to do so by Dr. Vladimir Porubcan, President of commission 22 of the IAU and by Dr. Zdenek Ceplecha of Ondrejov Observatory of the Czech Academy of Sciences. Drs. M.J. Betlem, dr. M.C. de Lignie and Drs. B.J.M. Kokkeler will contribute substantially to the scientific work and preparation of publications. A group of international observers at the Xinglong Station of the National Astronomical Observatories of the Chinese Academy of Sciences in China observed the Leonids on the night of 18/19 November. 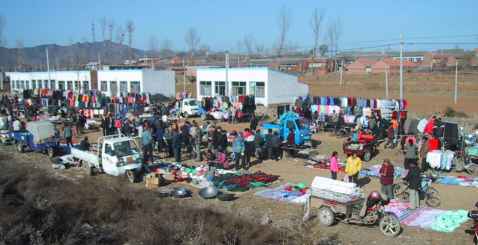 The Xinglong Station is located about 110 kilometers north-east of Beijing. The Leonids are dustparticles which are released while the comet 55P/Tempel-Tuttle passes the sun every 33 years. The meteors are called Leonids because they seem to emerge from the constellation of Leo. Tonight the observers experienced a real meteor storm. That is, meteors appeared at a rate of about 40 meteors per minute at maximum. It looked like meteors where raining from the sky, and at certain moments 8 meteors appeared at the same time. It seemed to the observers as though they could really see the earth moving through space. Rates went up from 15:00 UT (Greenwich mean time) when the Leonid radiant rose above the eastern horizon. The maximum was at about 18:06 UT, and after this time rates went down slowly. Many fireballs were observed especially in the second part of the night. 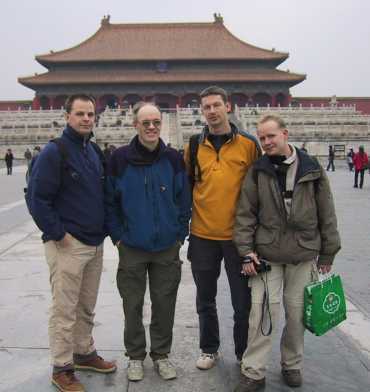 Arnold, Casper, Jos and Sietse on the Tian'anmen square with the entrance of the forbidden city at the background. It appeared to be the only cloudy day during our stay in China. Groupphoto of the second workshop held by Jos Nijland and Casper ter Kuile at the National Astronomical Observaties of China (NAOC). This workshop was primarely aimed at photography and a little bit on video. At this time the second team of the expedition was still on its way to China. 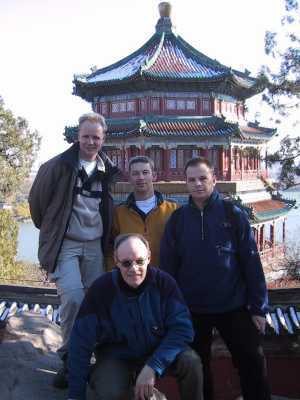 Here Sietse, Jos, Arnold and Casper pose in front of the summer palace. Weather was bright and clear again and so this siteseeing day became an big success! We could now observe the rapidly changing skyline of Beijing at the other side of the lake. 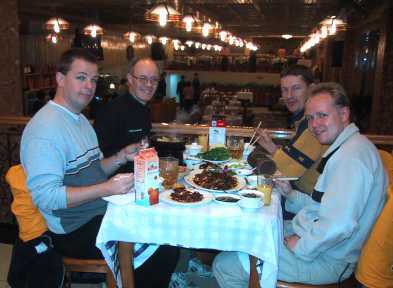 Arnold, Casper, Jos and Sietse at their famous restaurant near our Labour Hotel in Beijing. This fine hotel itself was also near the National Astronomical Observatories at Datum road which proved to be very handy while Jos and Casper had to present a couple of workshops for the students of NAOC. The Chinese food in the restaurant was excellent! 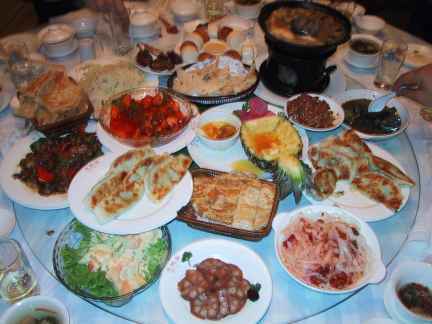 We got Beijing Duck, all kinds of Fish and lots of other delicious foods! No problem how much you eat, you surely will notice you will lose weight after you return home... Using the wooden sticks caused only minor problems and the use of a rotating plateau is a great idea! Here expedition members Sietse, Casper, Arnold and Jos pose for the Canon Ixus as they have just returned from their climb to the third station. The third station was located at the top of a beatifull mountain but is proved to be unsuitable for photographic and video observations. We setup the third station at the Miyun radio observatory at the roof of the observatory which provided Jos and Sietse an suburb view at all horizons! This location even improved the angle of convergence with the other stations. 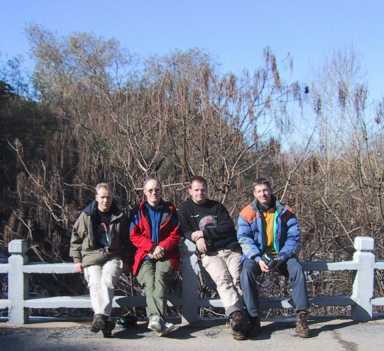 Expedition members Robert Haas and Michel VandePutte and their Chinese students leave Xinglong station to setup the second station at PanShan. 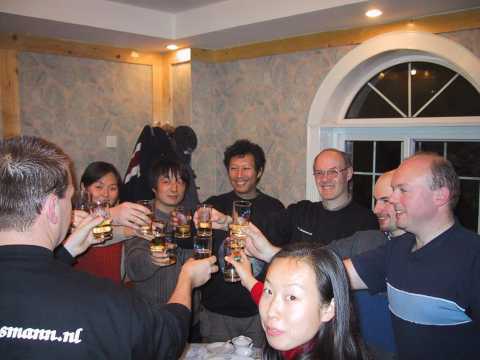 The members of the Sino-Dutch Leonid Expedition 2001 celebrate the success of their expedition. In the middle of this picture is Dr. Jin Zhu. The celebration is at our well know restaurant near our hotel. The dinner here was one of the very finest we experienced during our stay in China! And this is how such a great Chinese meal looks like. 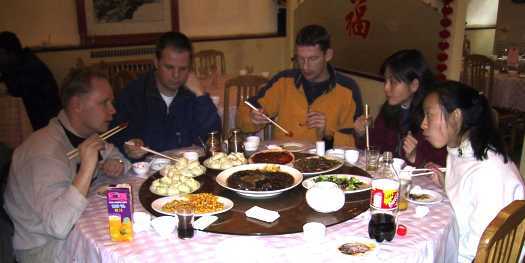 Note the round table with the rotating mirror. On it a multitude of dishes can be seen. Sometimes there is no room anymore and dishes are located on top of each other! 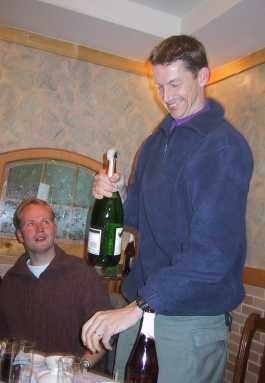 Jos opens up the Champagne bottle to toasts of the success of the Sino-Dutch Leonid Expedition 2001. 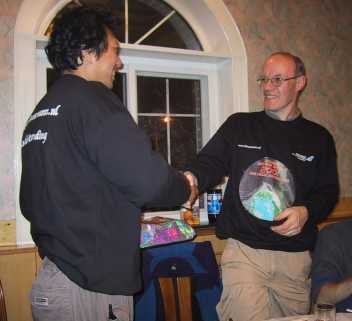 Casper ter Kuile hands over a present to Jin Zhu to thank him for all his invaluable help to make this the most successfull expedition in history. 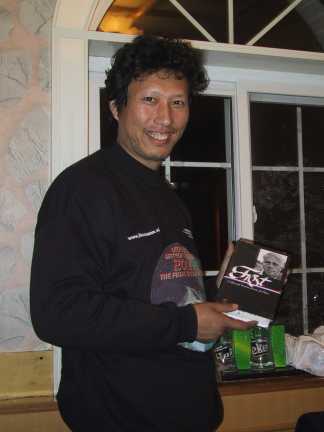 Jin Zhu shows the present he received from Lew Gramer who celebrated the success of the expedition together with us. Expeditionmembers Arnold Tukkers, Koen Miskotte, Sietse Dijkstra and Jos Nijland have a lot of fun at the celebration meal. At one of our last days in China we again visited the Great Wall. Here we stop for a short moment to do some shopping at a marketplace along the road. This is the outside area of Beijing and we just got away from the Beijing smog layer, note the clear view at the hills in the background. Such a Chinese marketplace intended for local people is a colourfull experience! A great view on the Great Wall from our first walk. Jos and I climbed also at the other site which was broken down but at the top of this part we had some very nice shots from this location and even carried some pieces of the Great Wall to the Netherlands... Again note the very good atmospheric conditions which permits views on large parts of the Great Wall. 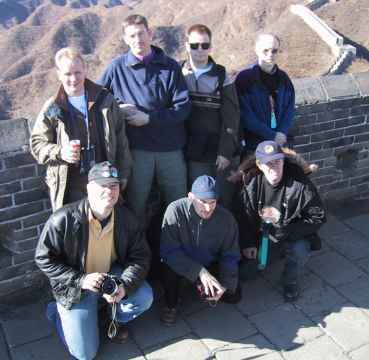 A groupphoto of the Sino-Dutch Leonid Expedition on top of the Great Wall in China taken by Jin Zhu! 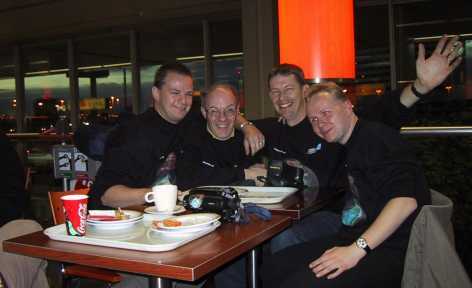 From left to right at rear are: Sietse, Jos, Arnold and Casper. In front are: Robert, Michel and Koen. 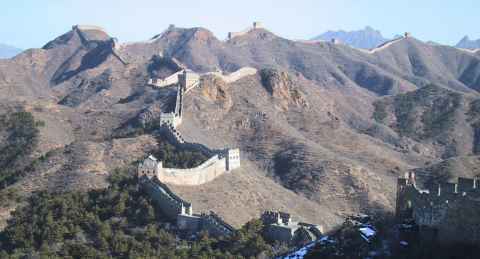 Later we moved to another, perhaps even finer, part of the Great Wall. We reached this part just before sunset when parts were orange coloured. Jos, Michel and Casper ran up to the highest point to have a great view at the surrondings.